I told some friends in the U.S. that I was going to the Hidden Kitchen for dinner. Then came the onslaught of questions, "Hidden, what does that mean?" How do you find the secret meeting place?" and "Who do you have to know to get in?" And, the one from my paranoid auntie, "Isn't that risky?" Yes, the name suggests secrecy, illegality, and a little risk---but that's part of the fun. In reality, as Laura--one of the persons behind this supper club--said, "The kitchen's not really hidden anymore." It's immensely popular in the foodie blogosphere I made my reservation 3 months ahead, and it seems I was lucky to get in. The seats fill up fast and so does the waiting list. Braden and Laura, two Americans now living in Paris, run the Hidden Kitchen from their home. Laura told me they initially began having the dinners twice a month to meet people in Paris, but word of mouth spread quickly, and dinners are now six times a month to meet the overflow in popularity. The entire dining experience feels more like you've been invited into an old friend's home for a party. When I arrived, I was greeted by Laura and a glass of champagne. As each guest arrived, Laura introduced us to the others, and the party started from there. The long dining table seated all 12 of us and was swathed in ivory linens and candles. At the table, I sat across from a couple from England and next to another couple who have a restaurant in Manhattan Beach. By the end of the night, we felt like old friends. The chatter around the table was warm and animated, so much so, that when Braden came in to introduce each dish one of the guests would cling his glass to quiet everyone down. Dinner is a 10-course medley of seasonal fare, and 7 of the courses are paired with wine. Braden is in charge of the food, and he comes out at the start of each course to explain the dish and answer any questions. When asked how he plans the menu, he said he looks at what's in season, starts with the vegetables and matches proteins to the vegetables, then goes from there to add the final touches and sauces. Laura is in charge of wine pairing and desserts. She gives information on the wine that's paired with the courses. The wines were well-paired with each dish. All dishes are a blend of French and American flavors, leaning a little more heavily on American flavors; these included grits, red pepper flakes, a buttermilk cake and even a Rice Krispie treat. Plating was executed exquisitely, with perfect attention to detail. At the end of dinner, even the dog Tatie came out to join us. Braden and Laura sent everyone out the door with a French two-cheek kiss, just like you would with friends, expecting to see them again soon. I was having such a good time talking with my table mates, plus the glasses of wine, that some of my notes are illegible and other parts nonexistent. But, I'll do my best to describe the menu to you. Amuse Bouche -- A little bite of "enjoyment to the mouth"
2nd Course -- Fava bean raviolo with spring onion in a herb broth -- the flavors of spring in one raviolo. 3rd Course -- Poached egg with chilled white asparagus and a parmigiano mornay sauce -- This was one of my favorite dishes. The egg looked like a beggars purse sitting atop the white asparagus. The mornay sauce added a richness and the grated pepper added a nice touch of heat. 4rd Course -- Seared salmon with rhubarb lime sauce and kohlrabi slaw -- Also one of my favorite dishes of the night. The rhubarb and lime sauce was sweet, but not too sweet, and went very well with the salmon. 6th Course -- The palate cleanser was their take on a Mint Julip -- It was a bourbon gelee with sorbet and mint. 7th Course -- Herb stuffed pork roulade with cheddar grits and green pepper relish with a Pernod cream sauce -- This was beautifully plated and all the flavors blended well together. I really liked the grits and the onion ring addition. 8th Course -- "White Salad" -- This is a little fuzzy (red wine always does that to me) -- It was a vegetable....pretty sure it was cucumber with parmesan cheese. 10th Course -- Petits Fours -- we had four of them -- one was a rice krispie treat, the other pate aux fruits (gelled fruit square), a chocolate truffle with chocolate and cardamon, and a soft caramel -- all of them were little bites of heaven--especially the soft caramel. It's a dinner that starts with a welcome and champagne and ends with scrumptious petit fours and lasting memories, and even some new friends along the way. I will definitely return the next time I'm in Paris. Public transit is an awesome thing here; well, it's an awesome thing anywhere. Here it's very easy to use. I have many choices for getting around. I always prefer walking, so I can really see the city at my own pace. Sometimes things happen and I have to use public transit, i.e. I'm running so late that walking will only delay me more, the three blisters on my foot hurt more than I can stand, or the rain is coming down so hard we might need an ark to survive. Today, it was the rain. I bought a sandwich from my favorite boulangerie and pastry from my favorite patisserie and was going to a nearby park to eat. Then, the downpour came and drowned all plans of lunch in the park, and my umbrella was in a great place---in my apartment. I did see a bus stop and ducked under the glass to keep dry. When the bus came, I hopped on. I thought I would wait out the storm riding around on the bus until the rain stopped; it was much warmer than the bus stop. Well, the storm ended, as the bus stopped at the Saint Martin Canal area. Perfect timing as my lunch was still in my hand. I had been there twice before with friends for drinks and remembered how nice it was. The canals are located just east of Gare de L'est in the 10th arrondissement. Cafes and shops line the quays on both sides of the canal. The area is very eclectic, as my friend called it. I would agree with him. There were nannies ushering kids out of school, long-haired "college students" lounging around the canal in deep discussions, older men sitting and smoking, and others sitting along the canal reading or having a picnic. I added myself to the mix, and had a quiet lunch along the banks. The canal has several iron footbridges along it. After lunch I strolled along the banks and over the footbridges exploring and taking some pictures. At the southernmost point of the canal is the Square F. LeMaitre. Also a great picnic and people watching spot with benches flanking the edges of the square. Older men were gathered around a table playing cards, others were playing Petanque (the French version of Bocce Ball). There were children all around, and there was even a ping pong table, with a fierce ping pong competition taking place. Running between the canal and the Gare de L'est is yet another park, Square Villemin. I will have to add both of these to my list, as the entire area is the perfect place to go to enjoy Paris without being in the chaos of a big city. It's also a great place to go to waste away an afternoon. I'm glad I forgot my umbrella because it got me on the bus. I was reminded to take the bus more--it's a quicker way to see the entire city, and it brings me to places I had forgotten about or that I had never seen (I saw another park, a fountain, and a street with a lot of outdoor cafes, which I had never seen before and I'll need to explore further.) And, if I didn't get on the bus today, you wouldn't get to see how lovely the Saint Martin Canal area is. Here, I've posted a few pictures that I took. If you would like to see more, you can go to here, to my Flickr photos, where I have many more photos of the Saint Martin Canal area and of Paris. Rainy days usually make me want to stay inside and curl up with a blanket and a good book. A Californian, I'm a wimp when it comes to cold and rain. I love the sun and the heat. I'll take an 100 degree day anytime over cold, rain, and even worse, snow. Once, I took a three-hour walking tour in minus 4 celsius and it was snowing. I have never been so miserably cold in my life, my lips were blue. Every time we passed a store that had warm clothing, I went in and bought something. I learned nothing on the tour, but I now have 5 layers of shirts and sweatshirts, along with a scarf and ski gloves all saying "Prague." Even though it was cold, I couldn't stay inside---I'm in Paris, and well, it wasn't snowing. I decided to walk and see where it took me. I didn't make it very far. I was shivering after about 10 minutes outside. (Did I say I was a wimp in the cold?) As I walked past the Cafe de Flore, I saw an empty table directly under an overhead heater--bright red and emitting warmth. The Cafe de Flore has been on the corner of Saint Germain Des Pres and rue Saint Benoit since 1890. Some have called it a historic landmark, and it has served many philosophers and literati. It also has hot chocolate that is pas mal. Today was a perfect day for hot chocolate, so I took a seat right under the heater. I didn't only get a cup of hot chocolate; I got a picture of it! It was thick and rich, almost like drinking melted chocolate but better by the addition of cream. I sat and drank and watched the rest of the world fight the rain. The heater warmed me on the outside and the chocolate warmed my insides; I was completely content. It couldn't have been any better of a day, even if I were at the beach. At 7.80 euros it's a bit pricy, but much less than buying up layers and layers of Paris sweatshirts. Below is a recipe for some heavenly hot chocolate. It's a little thicker than Cafe de Flore's, but that's a good thing, right? If you want to thin it out, keep the amount of chocolate the same and use more cream, maybe 4 ounces more. Chop the chocolate into tiny pieces and put it into a bowl. Bring the cream to a scald (when tiny bubbles form around the edges). Pour the scalded cream over the chocolate, let sit for 30 seconds to melt the chocolate, then whisk together. Reheat the mixture over medium heat until it's hot, whisking constantly, so nothing burns. Off the heat, use an immersion blender to make the hot chocolate nice and frothy. I tried to walk off my dinner from last night by covering six arrondissements today, about a 10 mile journey in total. The only problem with this plan is that I'm also trying not to look like a tourist and am wearing shoes that are more "Parisian looking." (I might also need to rethink wearing my wide-angle lens camera around my neck while I'm walking.) I'm certain it's the shoes that will give me away, so I can't possibly think of wearing comfortable tennis shoes. Something else must be going wrong though, because the street vendors---you know the ones selling the Eiffel Tower key rings or that will sketch you "for free"--- they've started yelling, "Yes we can! Obama, Obama." when I walk by. First of all, how could they possibly think that I am American? Don't they see the trendy black flats? And, why do they think that by cheering for Obama, this will get me, or any other American, to buy their stuff? Ya, I guess the trendy black flats idea isn't quite helping me blend. And now, the two blisters I have on the ball of my left foot have turned into three. Instead of chocolate, (you're getting sick of seeing all the food anyway, right?) I thought I'd share with you some of my favorite parks in Paris. It's amazing how many parks there are in this city. Sometimes you're walking down the street and there's a tiny park, crammed into a corner or nestled in between two buildings. Just around the corner from where I'm staying is a little park with a play area for kids and benches everywhere. And, it's right in the middle of an intersection of three large and busy streets. Trees and flowers in full bloom create a border to block out the chaos of the streets outside. Even better are the ponds and fountains, which seem to wash away the noise and pollution. I noticed that some of the parks even have WiFi access. Not all of them, but the ones that do have a purple sign at the entrance informing you that they have WiFi and giving you the access code. If only WiFi in Italy could be so easy to find. Here are my top park picks in Paris. These are great places to picnic, share a bottle of wine, eat a pastry, read your email or a book, watch the city go buy, or just rest your blistered feet. Jardin du Luxembourg (6th arrondissement)-- massive park with many fountains, ponds, benches and chairs. It's where you'll find crowds whenever the sun is shining. Champ de Mars (7th arrondissement) -- Long expanse of a park where you can sit on the grass with the Eiffel Tower looming over you. This is THE place to be on Bastille day to picnic all day long, and in the evening enjoy the fireworks with the swarms of other holiday revelers. Square Rene Viviani (5th arrondissement)--this park sits on the Quai Montebello right across from Notre Dame. You can sit in the quiet square, work on your computer (it has WiFi), and gaze at the Rose Window. Jardin Marco Polo (6th arrondissement)--right outside the Jardin du Luxemburg heading toward Blvd. Montparnasse, this garden has the Fountain of the Four Parts of the World. The mist from the running fountain will cool you off on a hot day. Place des Vosges (4th arrondissement) -- many trees for you to find shade and a fountain at each corner of the square. Square Vert-Galant (1st arrondissement)--at the end point of the Ile de la Cite, you can reach this garden at the middle of the Pont Neuf. It's a great place to share a bottle of wine and watch the sun set. Square Jean XXIII (4th arrondissement) -- behind the cloister of Notre Dame, this park has a view of the flying buttresses of Notre Dame. It also has Wifi access. Jardin des Tuilleries (1st arrondissement)--one of the biggest and most popular gardens in Paris. You have ponds, lawns, chairs, sculptures, flowers and a view of the Louvre and its Pyramid. 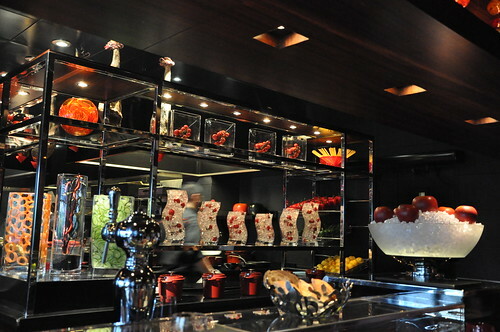 Atelier Joel Robuchon decor, originally uploaded by Food Lovers Odyssey. Paris is known to have some of the best restaurants in the world. They are also known to have some of the stuffiest, where all men must where a jacket the entire meal. Service is ultra serious with no casual conversation and, especially, no joking between waiters and clients. We wanted some of the best food in Paris without all the stuffiness. From many recommendations from friends (one told me it was the best meal she ever had), we chose L'Atelier Joel Robuchon. This restaurant is also highly recommended by The Michelin Guide (receiving two Michelin stars--rating it one of the 24 best restaurants in Paris), Gault Millau, and it's rated #18 of the top 50 restaurants in the world in 2009. The dining area is very modern (glass pictures filled with fruits or vegetables lined the shelves) and very casual, especially for French standards. Casual dress was fine; some were even in jeans. There are no tables, the seats are at the bar which is shaped in a "U" around the open kitchen. On one side of us was a German family and on the other side was a group from the U.S. Guests can see exactly what's happening in the kitchen and with their meal. You hear the chef firing orders and the response of "oui chef" from the crew. We watched the plating of each of our dishes, everything placed on the plate with the precision of a surgeon. I had the tasting menu. It was 9 courses of small seasonal plates. My friend didn't want the tasting menu and wanted to choose as he went. This can create a timing problem and at many fine dining restaurants it is required that each table order the same way, either a la carte or the tasting menu. Here, it was absolutely no problem. My dinner was a symphony of spring flavors. Highlights of my meal were Le Foie Gras, L'Oeuf (simply titled "The Egg), all the foams (foam was another theme of the night), and my two desserts (yes, I said two!). The foie gras was the best dish of the night. It was a sauteed slice of foie gras perfectly seared so that it was slightly crusty and carmelized on the outside and melted when I cut into it. Under the foie gras were cherries, and on top of it were thin ribbons of rhubarb, with hibiscus sauce drizzled on the plate to accompany it. Our waiter said it was also his favorite of all the dishes. "The Egg" was a martini glass of parsley cream, an egg (which was steamed in the martini glass so it tasted like a soft-boiled egg, but was cooked out of its shell), and a morrel mushroom and cream foam. On top of the foam they added 4 or 5 sauteed morrels. The first dessert was a three-herb sorbet on top of a sabayon cream. The sorbet of basil, mint and cilantro was a fresh and cool contrast to the rich sabayon. I only wish they had given me more than the melon ball-sized scoop of it. The second dessert was a chocoholic's dream. It was a Tahitian vanilla ice cream covered with a chocolate dome and served with warm chocolate sauce. My friend's dessert was also spectacular. He got a souffle that was light and airy and never fell. It stayed perfectly upright even after the waiter pierced the center with a spoon and slid a spoonful of pistachio ice cream down the middle. My friend devoured it in seconds before I could ask for a taste. The dinner was not cheap, but it also was fairly priced based on the quality of the food. The tasting menu was 140 euros. I also had the cheese plate (12 euros) and a glass of Sancerre wine (9 euros) that were not included. Yes, it was a splurge, but the price is still much less than a pair of Christian Louboutin shoes or a Dior outfit. It was a great evening of dining, and the wait staff were efficient, friendly, and quite happy to oblige my questions and photos. The waiters even joked with us. It was one of the best meals I've had in Paris. * Lamb cutlets with the famous Robuchon mashed potatoes. His mashed potatoes are supposed to have equal amounts of butter and potatoes. The lamb was so tender I could cut it with my fork. In Paris there aren't many places open on Sundays. That's ok with me. The streets are less crowded and there is much less traffic. I can wander around without worrying about getting burnt by someone's cigarette or a car racing towards me as I cross in the crosswalk, two dangers I'm always quite conscious of during the weekdays. It's now forbidden to smoke inside in France, so the smokers have taken to the streets. On the weekdays, the sidewalks are, so I'm constantly dodging swinging arms holding lit cigarettes. Today, I didn't have to dodge anyone, well that was until I got to the Bastille Market. That's where all the Parisians go on Sunday. The market has three aisles with vendors on each side and stretches about two city blocks. The shoppers were crowded in the aisles, so instead of dodging cigarettes, I dodged rolly shopping bags. I spent about 15 euros. With that I got a wedge of some gooey and stinky Pont L'Eveque cheese, olives, tapenade, a head of lettuce, a few carrots, 8 slices of prosciutto, a roasted beet, and a half kilo (a little more than a pound) of super sweet strawberries. I lingered at the market until almost closing, and found out that as it gets closer to closing time, the vendors start yelling out "specials," so the prosciutto was only 1.30 euros and the strawberries were a steal at 1 euro. My purchases made a great meal for at least two. With one of my leftover homemade baguettes, I made some crostini. The sun came out later in the day, so I opened up my window and invited a friend to join me. Not a bad meal, huh? Both the prosciutto (all of it has been eaten) and the strawberries (I have plans for the leftovers---stay tuned) are probably the best deals I've ever got at a market, and it added an extra exclamation point to an already perfect day. Have any you made one of those steal of a deals at an outdoor market? What was it and where was the market? Karina, a friend from culinary school, used to work at a boulangerie here in Paris. I was telling her how awesome it was for me to be able to walk down the street while I'm here and get a delicious baguette. In the East Bay in California there is only one place, the Model Bakery in St. Helena and Napa (and this is actually the North Bay), that makes great bread like the French. After hearing my complaints about the state of bread in my area, Karina asked, "Why don't you make your own baguettes?" She said this in the same way someone would ask, "Why don't you open the door?" Like it was that easy. Working in a pastry kitchen, I got plenty of comments from the savory side of the kitchen about how "scientific" pastry making is. I always replied that it's bread baking that's truly scientific, and one might need to be pretty close to a rocket scientist to make some good bread. "Suuuuure, Karina, I'll get right on that." She insisted that it was really easy, just flour, water, yeast and salt, no problem. Really? Even in a home kitchen? She assured me we could do it, and even got me to believe. We made plans to have a bread baking day, and I had visions of making baguettes the likes of Eric Kayser or Quartier du Pain, two of my favorite bread bakers here. I fantasized about baking bread that was so good, when I got back to the states, I would have a line at my front door with people begging me to sell them a baguette....at any price. Today, was the day. I woke up ecstatic and eager to start making bread. I think I was more excited today than the day I left for this six month journey I'm now on. What can I say, I'm a pastry geek. (I've been known to spend a Friday night or two with my fellow pastry kitchen geeks workers going gaw gaw over "PH10"--Pierre Herme's cookbook covering 10 years of his career--or other renowned Pastry chefs' books. Seeing how our recipes and methods compared to theirs. Yes, I'm a pastry geek. ) And, I couldn't wait to get started making bread and possibly becoming a bread baking geek, too. Yes, there are few ingredients, but the technique, ratios, and temperatures must be perfect and exact to get a good baguette. We made the baguettes a little less than half the size of a baguette you'd purchase at the boulangerie. We made them smaller so they would fit into Karina's oven. It was fairly easy. Although they were far from the best baguettes in Paris. It's a start, and you can be assured I'll be in the kitchen when I get back exacting this recipe and method. As you can see from the pictures, I can use some practice in forming them. Before they go in the oven, they should all be exactly the same size and shape. We stopped the proofing (letting the dough rise) at 21 degrees celsius/ 69.8 degrees F), and should have waited until the temperature of the dough was 24 celsius/ 75.2 degrees F (yes, we took the temperature of the dough). The bread was pretty good but was a little denser than I would have liked. I had one of the loaves for dinner along with some cheese. I've added the recipe below for those who want to try it and/or want to join the bread baking geeks club. The recipe is in metric weight. I'm leaving it that way because if I change it based on a computer translation, I'm afraid the rounding into ounces will alter the recipe. If you try the recipe, please let me know how it comes out. Make the starter by mixing the flour, water, and yeast together. Refrigerate covered for 18 hours. To make the dough, crumble the yeast into the flour and add the starter. Mix together a little, then slowly add the water. The humidity in the air will affect the amount of water you will need. It was fairly arid when we made the bread today. You should use enough water so that you can bring the dough together and it is slightly sticky. Mix together until a dough is formed, then add the salt and begin kneading until all the ingredients are well combined. You may need to lightly flour the work surface while you are kneading the dough. Cover and let rest for 5 minutes. Begin kneading the dough again until the dough becomes elastic (when you stretch it, it stretches without breaking), about 15 minutes by hand. Cut the dough in half and place each round of dough in a lightly floured bowl. Lightly flour the top of each ball of dough and let rise for one hour. After one hour, place the dough onto your work surface and tap down the dough with the heel of your hand. Fold it into an envelope. First by folding into thirds like a letter then folding the sides in. Put back into the lightly floured bowls and let rise about another hour until the dough's internal temperature reaches 24 degrees celsius/ 75.2 degrees F.
Form the dough by tapping it into a semi-rectangle, folding it over, and tapping it together to seal the crease. Repeat this two more times, then roll it into a log of approximately 1 1/2 inches in diameter. Press down on the ends to form points at each end and place on a baking sheet (a bread baking sheet would be preferred). Once all the baguettes are formed, score each baguette with a razor blade. Each score should be about 1/4 inch deep and be at an angle. Place in the oven and spray with water (this helps develop a crunchy crust). Bake at 450F for 15 to 20 minutes. The baguettes should be a deep golden color and when you tap the bottom, they should sound hollow.